Donald Trump's decision to move the US embassy to Jerusalem signals a key shift in US Mid-East policy — from decades of rhetorical pretense to full and explicit alignment with the Netanyahu agenda. A few weeks before US President, Donald Trump, announced his country’s recognition of Jerusalem as the capital of Israel, a debate was raging in the Israeli Knesset. A Knesset Bill that would have annexed major illegal Jewish settlements in the West Bank was abruptly postponed. Media reports indicated that the deferment of the vote was the result of behind-the-scenes US pressure. The so-called ‘Greater Jerusalem law’ was surprisingly shelved, for now, despite the fact that it enjoyed the backing of a majority of Israeli lawmakers. But why would the Trump Administration, which has offered full backing and support to the rightwing government of Benjamin Netanyahu pressure the latter in any way? And why would Netanyahu cordially oblige? In fact, ‘Greater Jerusalem’ is hardly a controversial topic in Israel, and the process to achieve that long-planned design has been in full motion for years. The delayed bill called for expanding the municipal boundaries of Jerusalem to include major illegal Jewish settlements in the West Bank, including Ma’aleh Adumim and the Gush Etzion settlement cluster. Moreover, it endeavored to bring 150,000 Jewish settlers into Jerusalem as eligible voters, who would have naturally tipped the political scene more to the right. Concurrently, the law would have further demoted the status of 100,000 Palestinians, who would find themselves in a politically gray area. Yet, Netanyahu conceded to the purported US pressure. Curiously, the reaction of his rightwing constituency was largely muted. Why would that be the case? Prevailing political analysis at the time concluded that the Trump Administration made the request to postpone the vote on the bill so as not to torpedo efforts by Trump’s son-in-law, Jared Kushner, aimed at restarting some kind of ‘peace process’. Unlike previous talks, the new ones would center around the concept of ‘regional peace’, or, what Trump referred to as the ‘ultimate deal‘. Trump’s Middle East ‘vision’ is different from the traditional US political framework in the sense that it espoused secretive multiparty deals, as opposed to open unliteral talks. In the new formula, Palestinian rights and demands would be marginalized, with Saudi-Israeli-US interests lying elsewhere, namely on pushing back — as they see it — Iranian expansionism in the region. Yet, to the surprise of many, including members of Trump’s own administration, he did something else entirely. He agreed to relocate the US embassy from Tel Aviv to Jerusalem, thus violating international law regarding the status of the occupied city. “I have determined that it is time to officially recognise Jerusalem as the capital of Israel,” Trump said in Washington on December 6. The US president has done what many had asked him not to do. But the truth is, US foreign policy has been bankrupt for years. It was never fair, nor did it ever intend to be so. Trump merely pulled the plug, not only on the so-called peace process, two-state solution, ‘land-for-peace formula’ but also all the other tired clichés that have been long dead. Trump’s announcement has also laid to rest the illusion that the US was ever keen on achieving a just and lasting peace between Israel and its neighbours. If Trump continues to advocate his ‘ultimate deal’, his decision on Jerusalem signals that he wants to do this with or without a Palestinian leadership on board. With the Saudis and Egyptians already showing willingness to participate in the US regional designs, Trump might be bold enough to at least try. This leaves the Palestinian leadership in a very tight spot. What is left to be said by those who have placed the Palestinian national project of liberation on hold for nearly three decades, waiting for the US to fulfill its self-designated role of an ‘honest peace broker’? The Fatah movement of President Mahmoud Abbas declared a ‘day of rage’ in response to Trump’s announcement. This politics of ‘rage’ is a way to deflect attention from the real crisis at hand: the fact that the Palestinian Authority (PA) has miserably failed in leasing the fate of Palestine to Washington, and, by extension to Israel as well. Some are arguing that the two-state solution is not US property to keep or give away, and that Palestinians can continue to advocate what seems to them to be the most plausible solution. However, the unpleasant truth is that the ‘two-state solution’ in its current form was itself an American formulation, part of a larger framework that was championed mostly by the US as it pushed Israelis and Palestinians to the ‘negotiation table’ since the Madrid Talks in 1991. Surely, there will be others who will attempt to continue playing that role, but what difference can Paris and London, for example, make if Tel Aviv and its powerful Washington benefactors have no interest in the subject whatsoever? Despite the initial doubts over whether Trump will go through with his decision to relocate the US embassy, his announcement should not come as a complete surprise. Between the hasty American withdrawal from Iraq, the ‘pivot to Asia’, the ‘leading from behind’ doctrine throughout the so-called ‘Arab Spring’, and the failure to press Netanyahu on freezing the illegal settlements in Occupied Jerusalem and the West Bank, US policies have been growing bankrupt and futile for some time. This paved the road for a new type of thinking, one that moves away from pandering to Israel, while paying lip service to peace, to wholly embracing the Israeli political discourse and future outlook. In fact, Trump’s announcement was a tamed version of his statement before the Israel lobby last year. In March 2016, Republican presidential candidate Trump delivered his famous speech before the American Israeli Public Affairs Committee (AIPAC). Of the many false claims and dangerous promises Trump made, a particular passage stood unique, for it offered early clues to what the future administration’s policy on Israel and Palestine would look like. “When the United States stands with Israel, the chances of peace really rise and rises exponentially. That’s what will happen when Donald Trump is president of the United States,” he declared. “We will move the American embassy to the eternal capital of the Jewish people, Jerusalem,” he announced. The mixed cheers and applause were deafening. Now that Trump is president, he inherited a failed Middle East policy from his predecessor, a policy that Trump finds of no benefit to his administration. What truly matters to the new president is the support of the very constituency that brought him to the White House in the first place. The rightwing, conservative, Christian-evangelical constituency remains the foundation of his troubled presidency. So, on December 4, Trump picked up the phone and began calling Arab leaders, informing them of his decision to announce a move that has been delayed for many years: relocating the US embassy from Tel Aviv to Jerusalem. Arabs fumed, or needed to play that part, for such a move would surely create further destabilisation in a region that has been taken on a destructive course for years. Much of that instability is the outcome of misguided US policies, predicated on unwarranted wars and blind support for Israel. Recognising Jerusalem as the capital of Israel is the last straw in an ailing discourse. The US Middle East political framework of the past is collapsing to the confusion of US allies in the region, and, of course, to the pleasure of Israel. In fact, Trump’s decision constitutes a total US reversal in its approach towards the entire Middle East, considering that Palestine and Israel have been at the center of most of the region’s conflicts. The US is currently experiencing unprecedented political instability. Talks of impeaching the president are gaining momentum, while his officials are being paraded before Department of Justice investigators to answer to various accusations, including collusion with foreign powers. Under such circumstances, there is no decision or issue that Trump can approach without finding himself in a political storm — except one: Israel. Being pro-Israel has historically united the US’s two main parties, the Congress, mainstream media and many Americans, particularly those in Trump’s political base. Indeed, when Congress passed the Jerusalem Embassy Act, back in 1995, Trump’s interest in politics was quite haphazard and entirely personal. To avoid violating the Congress’ public law, and to maintain a thread, however thin, of credibility, every US president has signed a six-month waiver; a loophole in the law that allowed the White House to postpone the relocation of the embassy. Fast forward to Trump’s AIPAC speech. His pledge to move the embassy seemed, at the time, merely frivolous and opportunistic. Clearly, that was the wrong assessment. Collusion between Trump’s team and Israel began even before he walked into the Oval House. 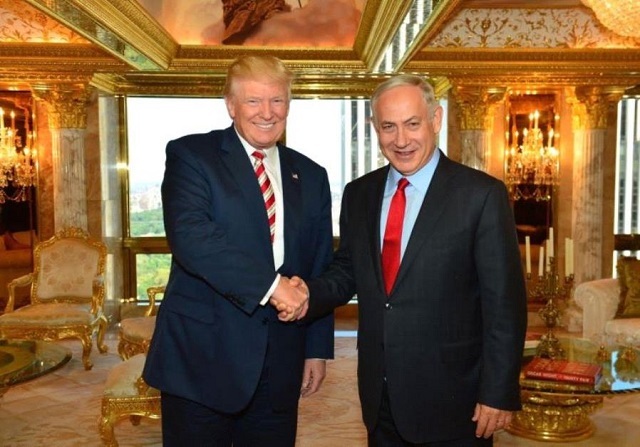 In December 2016, President-elect Trump worked together with the Netanyahu administration to undermine UN efforts to pass a resolution condemning Israel’s continued illegal settlement in the Occupied Territories, including Jerusalem. Chosen to lead the ‘peace’ efforts was no other than Jared Kushner, a Trump family member and a good friend of Benjamin Netanyahu. Trump’s dedication to Israel was clearly not fleeting. Trump has finally decided to shed a mask that every US president has worn for decades. And by doing so, the US will, oddly enough, negate the paradoxical role it had carved for itself over the past 50 years – that of “peacemaker”. Netanyahu now may resume with his plans to expand the borders of Jerusalem. His ‘Greater Jerusalem’ dream is increasing becoming a reality.